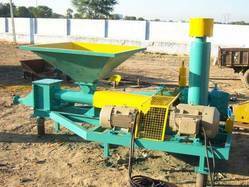 Our range of products include automatic cement feeding system and cement feeding system. We are engaged in manufacturing of Automatic Cement Feeding System. The materials to be conveyed enter the hopper by gravity or dumped by any means. 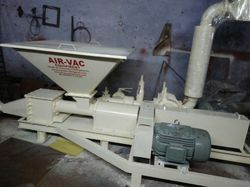 The material is compacted as it is advanced. Its density is further increased in the space between the terminal flight of the screw and the face of the non-return valve to form a seal against the transport line pressure, thus preventing blowback. The material then enters the discharge body, is fluidized by compressed air, and is conveyed into the transport line. The Air-Vac Equipment Screw Pumps are heavy duty, screw type pneumatic pumps. These pumps systems are most commonly used to convey dry, free-flowing, pulverized materials from grinding mills, transfer materials from silo to silo, transfer dust from collectors, and load and unload railcars, a pipeline can be run and to any number of delivery points.